This mesmerizing lagoon is sure not to disappoint anyone and offers an otherworldly and unforgettable experience. To many it is simply known as the ice lagoon since action scenes in James Bond Die Another Day and such movies made this dramatic and surreal landscape famous. The Jokulsarlon glacier lagoon is located at Breiðamerkurjökull, an outlet glacier of the magnificent Vatnajökull Glacier which lies beyond it. 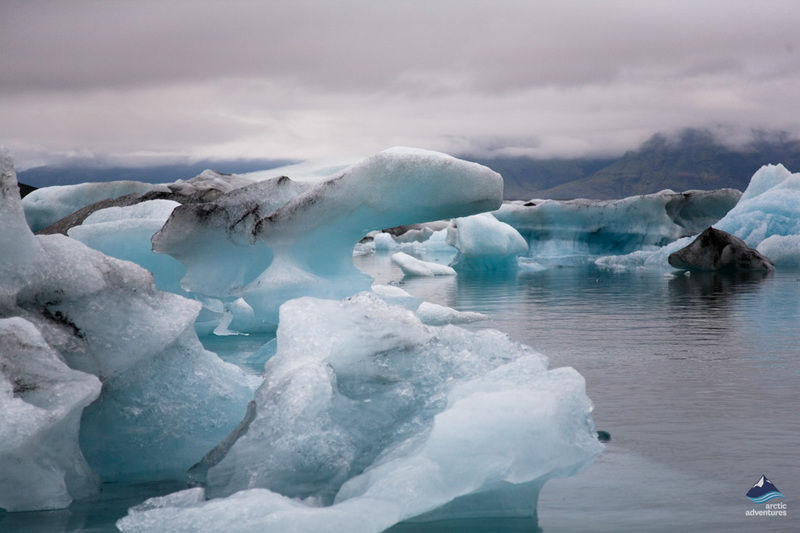 Find more information about the Jökulsárlón Glacier Lagoon. Jökulsárlón offers such an exclusive and otherworldly experience for its visitors. To many people, the glacier lagoon is simply known as the ‘ice lagoon’ since some action scenes in James Bond Die Another Day and such movies made this dramatic and surreal landscape famous worldwide. The lagoon is fed by Breiðamerkurjökull, which is an outlet glacier from Vatnajökull, the largest glacier in all Europe. The glacial lake is getting bigger every year and it is now about 18 km². If you already went to Jokulsarlon one day, you can find it totally different when you go back because the landscape is always changing. In fact, the glacier tongue is receding very fast, letting many ice chunks fall from it. 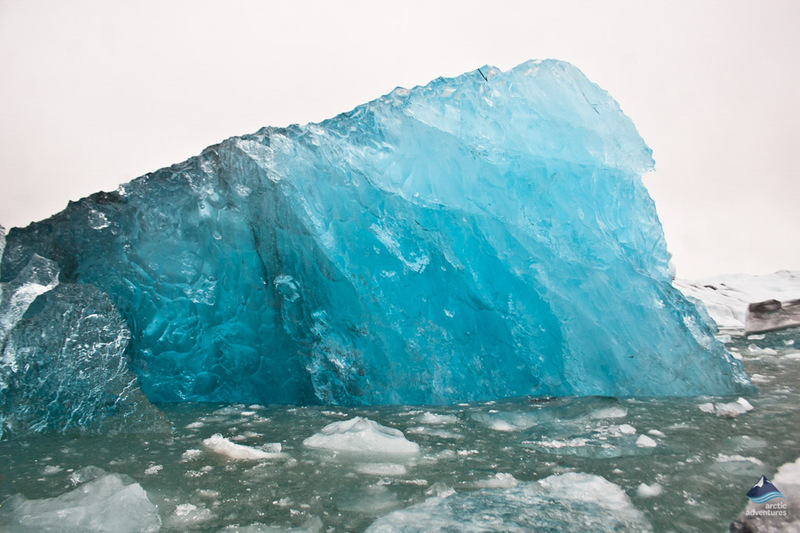 Some icebergs are incredibly bright blue, others have gray streaks from the ash residue of anterior volcanic eruptions. 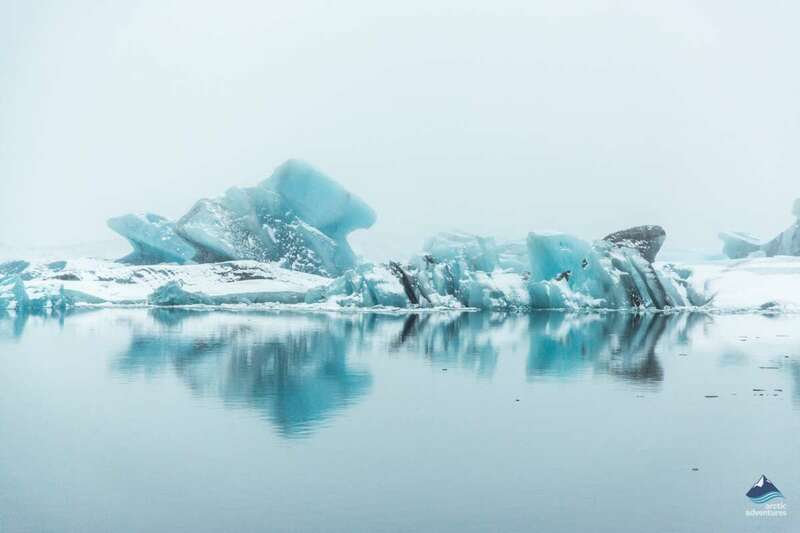 Depending on what kind of icebergs there are floating in the lagoon, Jokulsarlon can look like a completely different place from one month to another. That is why no one would never get bored of the glacier lagoon. 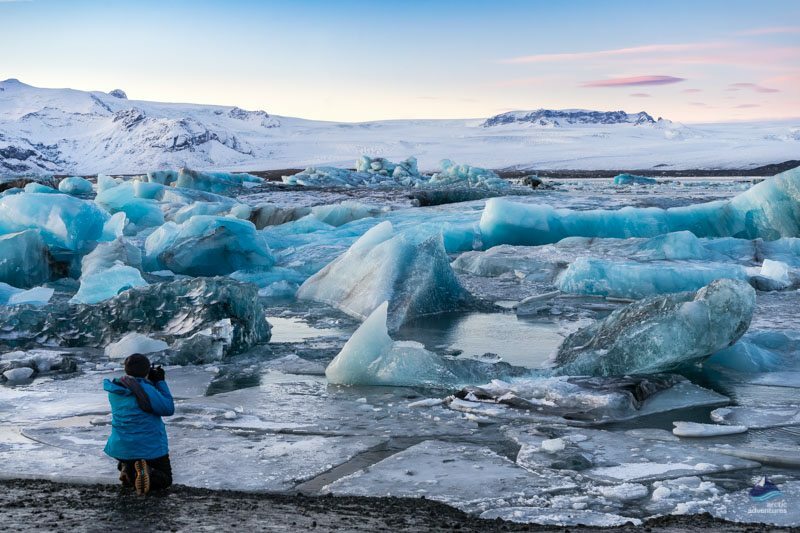 Jokulsarlon is one of the most famous tourist attractions in Iceland, it is definitely the highlight of the South Coast. It is also known as the ‘Crown Jewel’ of the country and is home to some seal colonies. The glacier lagoon is for sure one of the most beautiful and dramatic spots in Iceland. This area can be explored in one day, and the best way to live this moment to its fullest is to join a boat tour. What could be more magical than a boat tour on Jökulsárlón glacial lagoon, navigating between massive icebergs and playful seals? This is a one in a lifetime experience that you will definitely never forget. During the summertime, you can choose between different possibilities to discover and enjoy the beautiful landscapes of the lagoon. 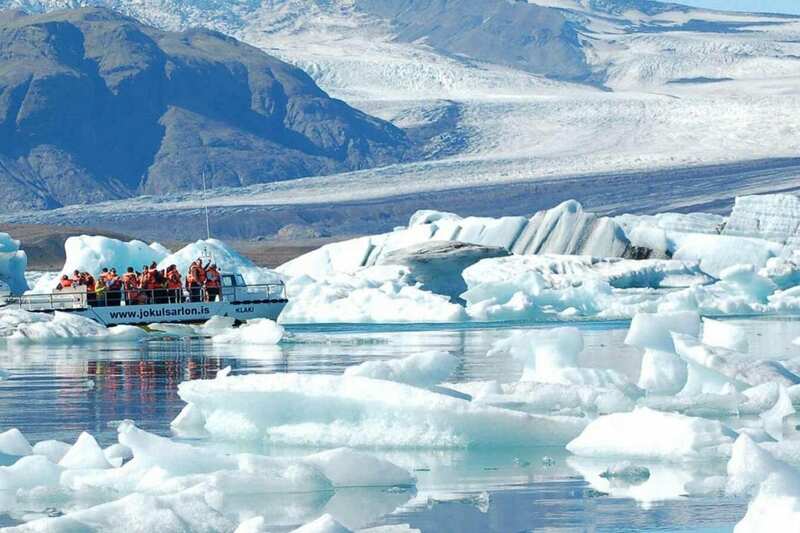 First, you can take the amphibian boat to visit the natural wonder of Jokulsarlon glacier lagoon from the inside. Aboard this astonishing four-wheel boat, the guide will tell you everything about the history and facts related to this emblematic place of Iceland. While this extraordinary boat will be driven on land to take you into the lagoon, all you have to do is enjoying the view and look around for some seals. Another option is to join a zodiac raft tour to experience a unique adventure, where most of the tourists will never go. 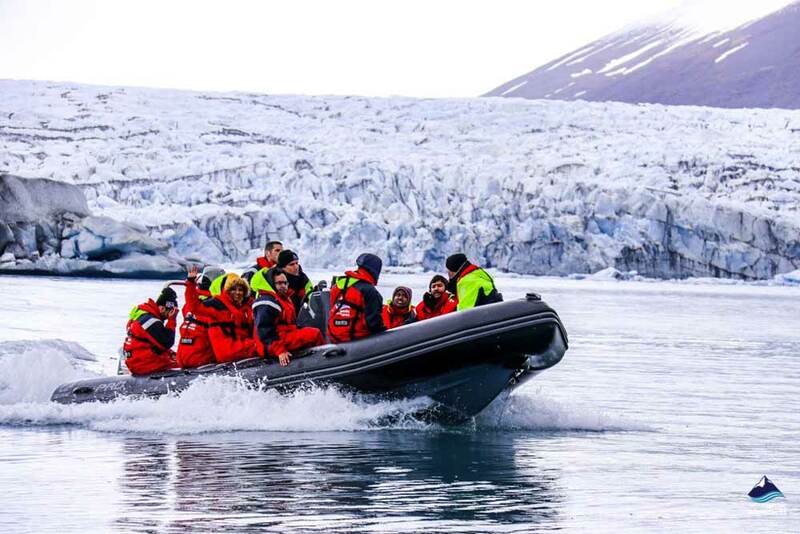 The speedy inflatable boat will take you all the way to Breiðamerkurjökull glacier while you will have a closer look to the icebergs and maybe spot some seals and ocean birds. This option is optimal for those who want to get closer to the glaciers as the zodiac will be able to reach farther in the lagoon than the amphibian boat. A kayak tour is also a great idea to admire the wonders of Jokulsarlon. The boats are stable, it is really safe for everyone, even for those without any previous kayaking experience. This tour is only available from June to September. Kayaking is the ideal way to navigate quietly on the lagoon, paddling smoothly and feeling part of nature in those calm and deep waters. You will be able to touch the glaciers and discover places which cannot be seen any other way. Kayaking in Jokulsarlon is truly an experience you don’t want to miss and if it is not in your bucket list yet, I suggest you add it and come check it off with us! 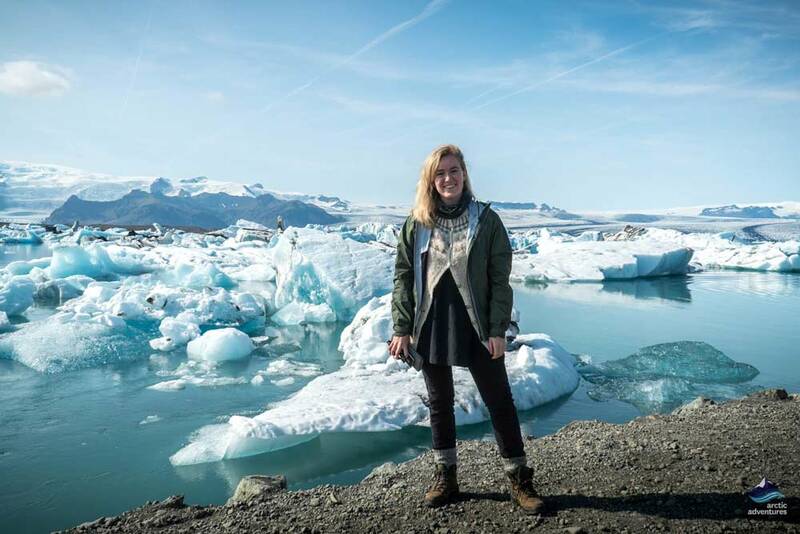 Join one of the Jokulsarlon tours and get a chance to taste the ice which is over 1,000 years old. To reach Jokulsarlon, you can join a tour to the South Coast from Reykjavík and make the most out of your trip to Iceland. There are so many things to see on the Southern part of the country. Between waterfalls, glaciers and black sand beaches, you will certainly feel like you have landed in another world. Jökulsárlón Glacier Lagoon is Iceland’s deepest lake, with a max depth of 248 meters. The Lagoon’s area covers 18 sq km. Seals and fish live in the water and rich wildlife flies above including the Arctic Tern and the Great Skua. 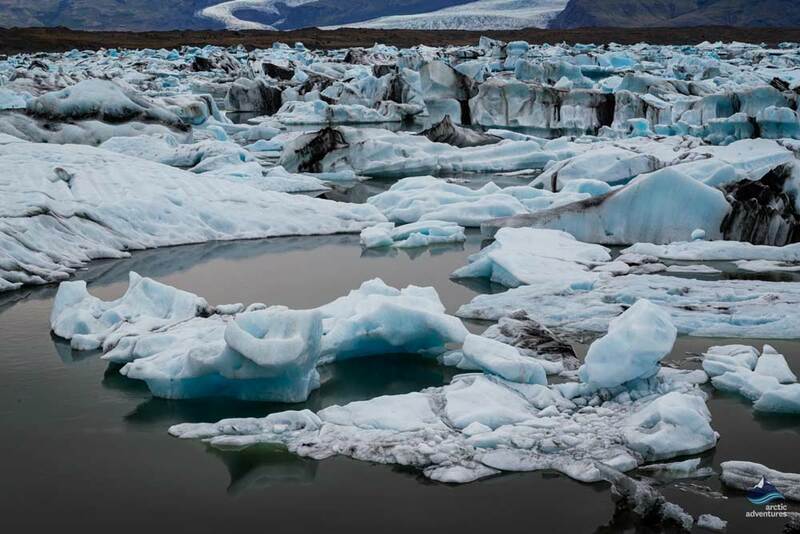 The water and its icebergs originate at the Breiðamerkurjökull glacier an outlet glacier from Europe’s largest glacier Vatnajökull. Jökulsárlón was also known as Breiðamerkurlón after the glacier it originates from. From Jökulsárlón runs the Jökulsá river, the shortest river in Iceland. In 1894 the area from the glacier to the ocean was only 256 meters and no glacier lagoon had formed. After the Jökulsárlón glacier lagoon formed it cut off the Ring Road and people couldn’t reach the South East without going a full North circle. It was later bridged making the area passable. From the year 900 there was a farm with habitats right where the lagoon sits. It’s buried under the glacier during the years 1695 to 1709 but is now again popped up from under the glacier. Still, water covers the area and no one lives there. Jokulsarlon is about 370 kilometers (230 miles) East from Reykjavík. It is very close to the Ring road and from the Icelandic capital, the drive is approximately 4.5 hours. It is located in the South-Eastern part of Iceland, on the edge of Breiðamerkurjökull glacier, in Austur Skaftafellssýsla county. Jokulsarlon is on the southeastern border of the Vatnajökull National Park. Around the year 1935, Jokulsarlon began to form because a glacier called Breiðamerkurjökull had retreated back from the edge of the Atlantic ocean. Indeed, the glacier got thinner and melt gradually. Breiðamerkurjökull carved into the land and formed a hollow which filled up with melted water, creating the lagoon. 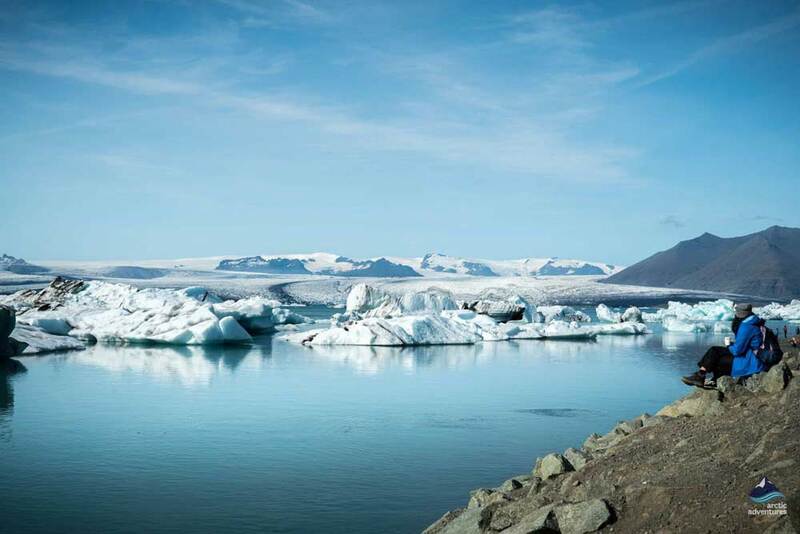 Still today, the glacier keeps melting, feeding the lagoon with icebergs that constantly calve off Breiðamerkurjökull. 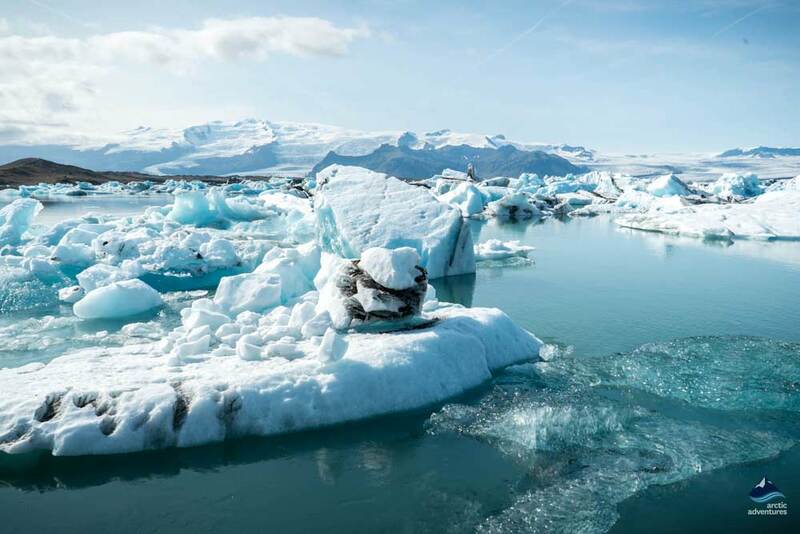 Since then, the glacier lagoon kept growing and it has even been found that the size of Jokulsarlon has increased fourfold since 1970 until today. Surprisingly, the cold does not prevent animals to choose Jokulsarlon as their home. The glacial landscapes of Iceland host a great variety of wildlife. Many seabirds such as the Arctic Terns, Seagulls and the Great Skuas are present around the glacier lagoon. However, beware of the Arctic terns as they are very protective of their eggs and use to dive-bomb the visitors who are going too close to them. The reason why there is such a rich birdlife in Jokulsarlon is that the fishes that are present in the lagoon make the perfect buffet for them. Other bigger animals are also often spotted around Jokulsarlon: the seals of course! They love to swim between the icebergs or lie on them for a nice sunbath, they can also be seen in the waters of the Diamond Beach. As Jokulsarlon has tides, seals, as well as some fishes, join the glacier lagoon when the water runs into it. The lagoon is accessible all year round, but boat tours are only in operation during the summertime and are dependant on the weather. Since Jokulsarlon is a glacier lagoon, it can get really chilly. It is recommended to bring appropriate clothing such as warm clothes, a hat, a scarf, gloves and good shoes even if the sun is shining and you are visiting during summer. Always dress in layers so if you are too warm you can take one layer off and vice versa. There is a café with restrooms right beside the lagoon. There, you can have a hot drink and eat something in a warm place. Wheelchair users can view the lagoon but many activities on and around the glacier are not suitable for people with limited mobility. It is always better to book your boat tour in advance to be sure to have a seat left, mostly if you are traveling with a group of people or if you are visiting during high season. During the boat tour, you will have the opportunity to taste the ice, which is one of the purest you will find in your life. Like many places in Iceland, during the summer months, the main tourist attractions are crowded. In winter, there are fewer people coming to Iceland due to the few hours of daylight and the low temperatures. So if you go to Jokulsarlon during the winter time you would benefit from smaller crowds and lower prices on everything. However, you will not be able to join a boat tour as they run only during summer. Roads conditions can get really hard from October to April so it is better to visit with a guide. During summer, you can take advantage of the midnight sun and the full 24 hours of daylight in the end of June to visit the glacier lagoon during the evening to meet fewer people. It is a good tip to visit the most crowded locations with fewer tourists. Jokulsarlon glacier lagoon rings a bell to many people. If you are wondering where you have seen this place before, it could be in many different famous movies such as James Bond, A view to a kill (1985), James Bond, Die another day (2002) or also Lara Croft, Tomb Raider (2001). 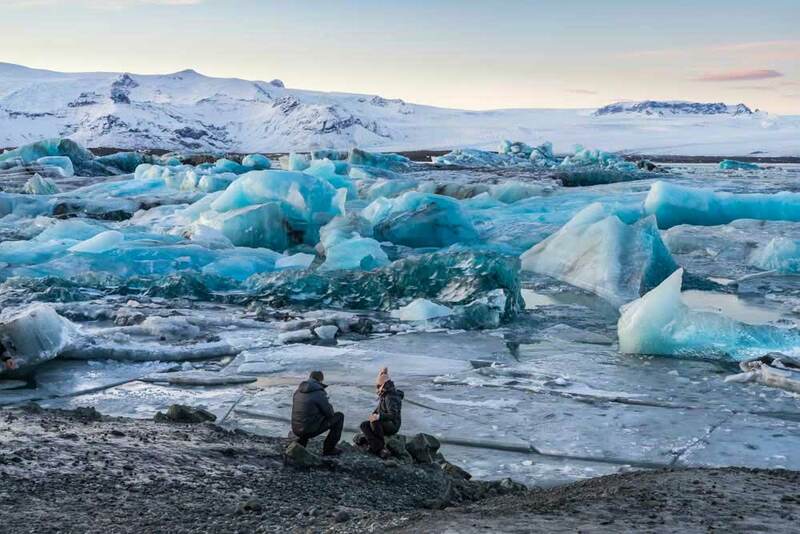 The young singer Justin Bieber also chose Jokulsarlon as the setting in his music video “I’ll show you“, and even took a dip into the lagoon (of course, this is not recommended at all, you should never try to get into the icy cold waters of Jokulsarlon). That is something you definitely do not want to miss! Right beside the glacier lagoon lies the Diamond Beach, approximately one kilometer away from Jokulsarlon, on the other side of the main road. 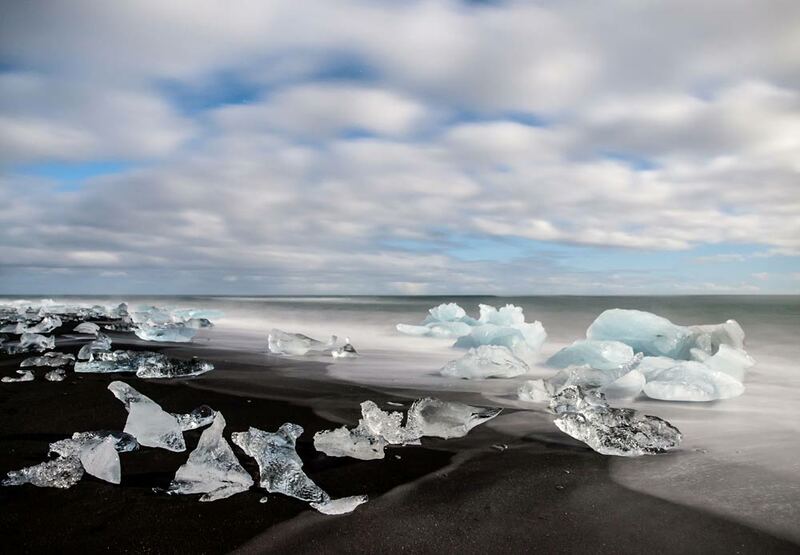 The real name of this black sand beach is Breiðamerkurssand, but it is known as the Diamond Beach because there are countless ice chunks glistening in the sun. 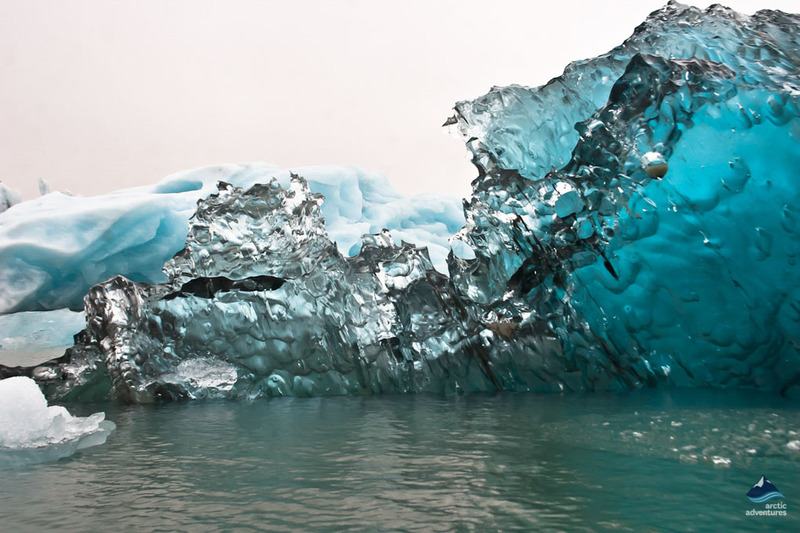 Most of the bergs are huge blocks when they fall from the glacier into the lagoon. Then, they will float and reach the sea via Jokulsa river, melting slowly and being washed up on the shore of Diamond Beach. The black volcanic sand of the beach contrasts with the white or blue icebergs and makes this place one of the most photogenic in all Iceland.